Mabuhay! 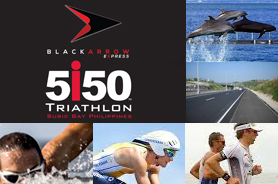 Welcome to the Black Arrow Express 5i50 Philippines website. We are very excited to be able to host this event. After five years of successfully staging the Cobra Energy Drink Ironman 70.3 Philippines and the Alaska Ironkids Philippines, we are very pleased that Sunrise Events has been awarded by the World Triathlon Corporation the rights to stage the 5i50 Series. The 5i50 series is the Olympic Distance brand of WTC. We are also pleased to announce that Subic Bay has also agreed to be our host venue for 2018. Although Subic Bay has been host to many multi sport events, we will make it our challenge to make the 5i50 another world class production.